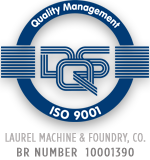 Our fully staffed Machining Division provides a broad range of machining functions. The CNC Division offers some of the largest and most modern Machining equipment and is housed in a new 30,000 sq/ft facility, while our Machining Division functions in producing and repairing manufacuring machinery and machined parts. HAAS SL-30 CNC Lathe – (2 axis) 3.5” through spindle bore, 30hp, 15” swing over bed, max length 33”. HAAS SL-40 CNC Lathe – (2 axis) 4.7” through spindle bore, 55hp Big Bore Kit, 25.5” swing over bed, max length 37”. HAAS SL-10 CNC Lathe – (2 axis) +.750” through spindle bore, 10hp, 6.7” over bed, max length 16”. HAAS VF-7 Vertical mill – (3 axis) 28” x 84” table, 30hp, height under spindle 27”, 4000# table capacity. Bullard 46″ Model 75 Vertical Boring Mill: Capacity 38″H x 56″ dia. Clausing-Colchester Gap Bed Engine Lathe, Model # Magnum 1250: Capacity 120″ x 24″ dia. Fifield Tool Co Engine Lathe: Capacity 21′-0′ x 10′ x 0″ dia. Lodge & Shipley Lathe: Capacity 96″ x 20″ dia. Lodge & Shipley Lathe, Model # 2013-17: Capacity 150″ x 24.625″ dia. Mazak Gap Bed Lathe: Capacity 240″ x 30″ dia. Mazak Lathe Heavy Duty, Capacity 31′-0 x 42″ dia. Monarch Toolroom Lathe; Capacity 26″ x 10″ dia. Bear Precision Balancer, Model #354R: Capacity 50″ x 19.5″ dia. Bear Precision Dynamic Balancer, Model #375-R: Capacity 12′-0″ x 6′-0″ x 36″dia. Blanchard #18 Grinder, 36: Diameter:Capactiy 15″H x 36″ dia.